Originally published under the title "Turkey and Terrorists." 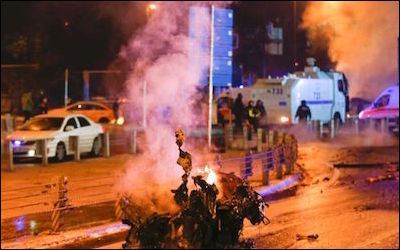 Police arrive at the scene of an explosion in Istanbul on December 10. A few days later, Israeli Defense Minister Avigdor Lieberman issued an order outlawing the Istanbul-based International Kanadil Institute for Humanitarian Aid, a Turkish aid group, accusing it of funneling money to Hamas and the Muslim Brotherhood. "The Kanadil foundation is identified with Hamas and with the Muslim Brotherhood and in recent years had been used as a main pipeline for funding projects by Hamas in Jerusalem," Lieberman's spokesperson said in a statement. Turkey's logistical and political support for its ideological next of kin, Hamas, did not come as a surprise, despite normalization with Israel: for Turkey's rulers, there are terrorists, and terrorists who go with fancy tags. One would expect such a front-runner ISIS victim as Turkey to have empathy for victims elsewhere. In a November interview with Israel's Channel 2, Turkish President Recep Tayyip Erdogan said that he does not view Hamas as a terrorist organization. He called it instead a "political movement born from [a] national resurrection." He also said he meets with Hamas "all the time." What Erdogan says about terror and terrorists often makes perfect sense. On June 11, 2016, he said that "for us there is no good terrorist or bad terrorist; all terrorists are bad." On June 15, 2016, Erdogan proposed that "let us oppose terror regardless of the terrorist's identity, rhetoric or faith... Let us disapprove of [terror] whoever it targets." And on Dec. 1, 2016, after meeting with German Chancellor Angela Merkel, Erdogan said that "terrorism has no religion, nationality or identity ... that we should exhibit a common stance and common solidarity in our fight against all kinds of terror." 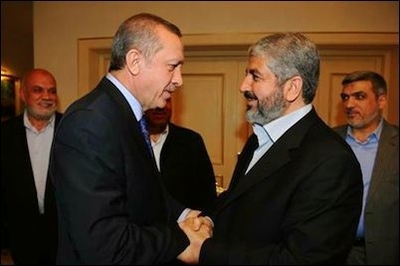 Erdogan warmly greets Hamas chief Khaled Meshaal in Ankara, March 2012. Turkey, since a near civil-war paralyzed life in the 1970s, has been one of the most notable victims of terror in the world. The street violence along ultra left- and right-wing lines took thousands of lives and led to a military coup on Sept. 12, 1980. After barely three years of relative peace in post-coup Turkey, the Kurdistan Workers' Party (PKK) burst onto the scene in 1984, launching a violent campaign for a Kurdish homeland. That war has so far taken nearly 40,000 lives. Turkey also is a relatively recent target of the jihadist Islamic State of Iraq and the Levant (IS). In its latest attack shortly after midnight on the New Year's Eve, an IS militant killed 39 people at an upscale Istanbul nightclub. By a modest estimate, in less than half a century, tens of thousands of Turks must have lost their lives in terror. Common sense would expect such a front-runner victim at least to have some sense of empathy for terror victims elsewhere. Right? Wrong. Not in Turkey. Unfortunately, Erdogan's ideological attachments visibly defeat his fake rhetoric that there are no good terrorists and bad terrorists. On Jan. 8, four Israeli officer cadets were killed and a dozen wounded when a Palestinian driving a truck ploughed into them deliberately. Israeli police said the dead, three women and one man, were all in their twenties. Among the wounded three were described as in a serious condition. Hamas, Erdogan's "political movement born from [a] national resurrection," praised the truck attack but did not claim responsibility. In a statement, the group's spokesman Abdul-Latif Qanou called it a "heroic" act and encouraged other Palestinians to do the same and "escalate the resistance." Ten statements condemning terror. Not a word for the young victims in Jerusalem. Unsurprisingly, Erdogan who "opposes terror regardless of the terrorist's identity, rhetoric or [religious] faith ... whoever it targets," has not condemned the latest attack in Jerusalem. His mind may have been too busy with victims of terror in his own country. But then Turkey often has a "Protocol B" level of condemnation of acts of terror abroad: Leaders may remain silent but, officially, the Foreign Ministry does the job. On Jan. 10, the Turkish Foreign Ministry's web page exhibited a list of press releases on various subjects including terror attacks in foreign countries. A simple check would reveal that between Dec. 1, 2016 and Jan. 10, 2017 the Ministry had issued two press releases condemning terror attacks in Egypt, two in Iraq, one at the Mogadishu Airport, one in Berlin, one in Somalia, two in Yemen and one in Jordan. Ten statements in total condemning terror. Not a single word for the young victims of terror in Jerusalem.